The drama unfolded on the Giant Saguaro Cactus in Arizona's Sonoran Desert. It is an enormous plant with two-inch spikes and is thought to be up to 300-years-old.Photographer Curt Fonger, 69, captured what happened on film. He said: 'A friend called me at 7am saying one of his workers had seen a bobcat being chased by a mountain lion. 'It ran across the road in front of his car and climbed up a large saguaro cactus at the roadside, with the lion hot on its tail. 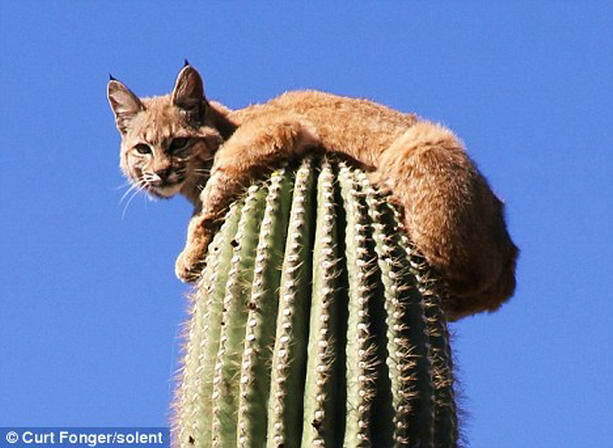 'The lion didn't pursue the bobcat up the cactus but circled the base. 'It looked up at the bobcat, growled several times, then turned around and trotted back up from where it had come. 'The mountain lion probably had cubs, the bobcat had intruded on its territory and she gave chase to warn the bobcat not to come close to her young family. 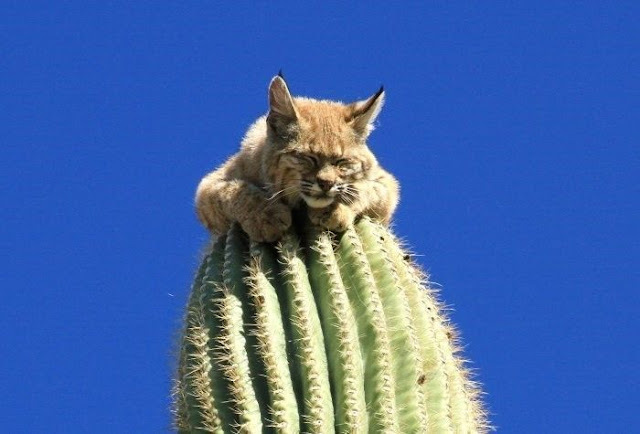 'I was astonished that the bobcat was on such a high prickly perch. 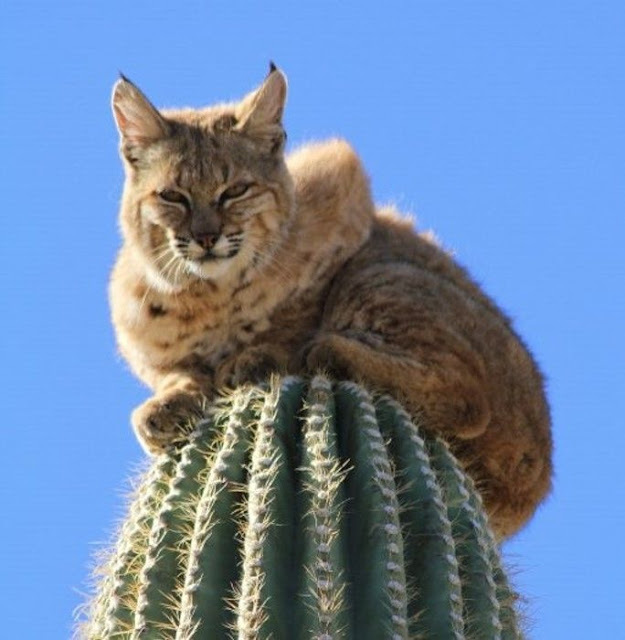 'In fact, the beautiful creature seemed quite content and was lying on top of the cactus. It only stood up when I got it's attention. 'But I found out later that the bobcat stayed put for over six hours before finally deciding it was safe enough to come back down. 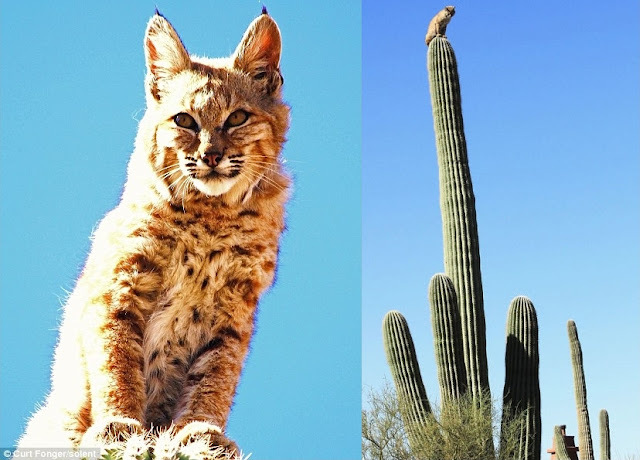 Curt, from Gold Canyon, Arizona, added: 'Although it may be common for a bobcat to escape one of it's major predators, it is very uncommon to have witnessed such an event first hand. 'I personally examined the base of the giant cactus after the bobcat had left. 'There was no hair or blood - only claw marks. 'Its a successful story of a bobcat avoided being eaten by a mountain lion with a happy ending of it's successful exit back into the desert.' The giant cactus is extremely rare. Just one in 1,000 seeds germinate and it then takes up to ten years to grow one inch.Its first arm develops between the ages of 75 and 100 years old or about the time they reach 15ft. 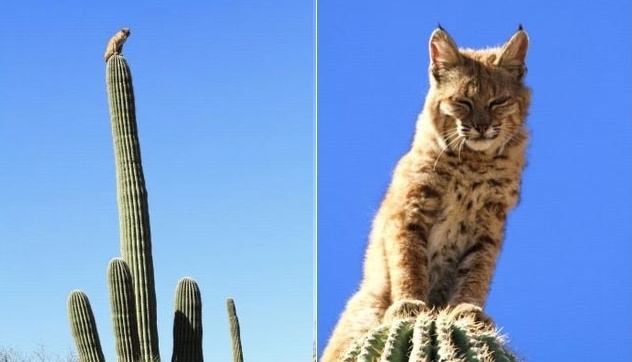 Responses to "Bobcat Sitting on Top of 40 Foot Tall Cactus in the Arizona Desert"
Cats love to perch on impossible things. This reminds me of a Bunuel film. I'm still blown away by how it can withstand all those spikes! I've messed around and got hit by some cactus, and they don't play...serious pain. This guy, however, he just does not give one half of a damn. Does anybody still believe we need to get cats down from trees...? 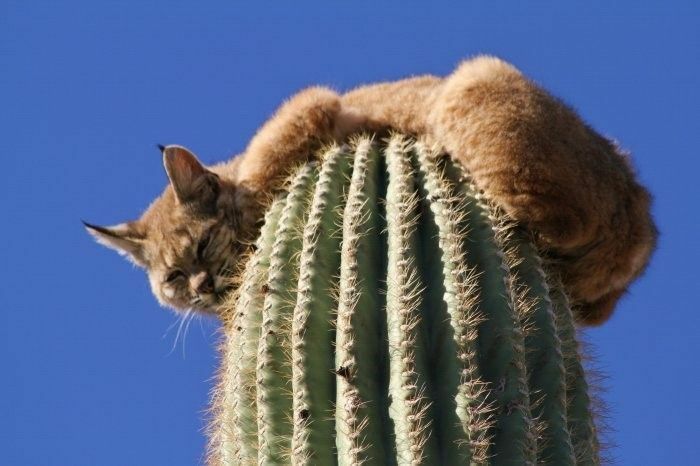 :) Wild cats wouldnt climb a cactus like that if they don't know how to get down. Do you hear me grandmothers?? "Born and bred in a Briar Patch", said Brer Bobcat. "Jump, Bob -- you know you'll land on your feet!! This a very rare sighting. I`m 72 and have been an outdoorsman all my life and have only seen two; one briefly at night and the other I hit in my car at dusk in New Hampshire two years ago. I was devastated. After I calmed down I examined it in all its beauty. There is a good reason why so many schools adopt this animal as its mascot. They are powerful, resourceful and ferocious. I think he may have simply velcroed himself to the top. Great shots....!